A further series of Divisional Seceretariat Reconciliation meetings was held in Mannar and Kilinochchi Districts on April 24 and 25. The first two in Madhu and Musali saw participation by a large number of Grama Niladharis, while helpful information and ideas were provided by Education and Health and other officials. A representative of the International Organization for Migration attended one meeting, and a peace educationist the other. Amongst problems noted were the difficulties of ensuring decent prices for the good harvests that were being obtained, the need to promote value addition to agricultural produce, and deficiencies with regard to training and career opportunities. It was decided therefore that Grama Niladharis should conduct Livelihood Development meetings each week, to discuss with the people for whom they were responsible the new initiatives that should be undertaken. Another committee that it was decided should be set up was an Awareness and Protection Committee that would discuss problems that might arise, and promote solutions based on community cooperation. With regard to health, it was noted that better education was required with regard to problems ranging from dengue and drugs to reproductive health. Partnerships needed to be developed with education and health officials to ensure better awareness, with mechanisms for counseling for those in need. 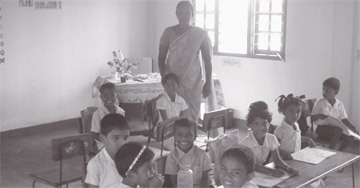 The Women and Children’s desks of Police stations should participate in such meetings, whilst personnel dedicated to each GN division would be expected to liaise closely, on a daily basis if possible, with Grama Niladharis, to develop systems of advice and rapid reaction in case of problems. The final area in which it was agreed that better coordination was needed was that of cultural and social activity. GN divisions should set standards for schools with regard to extra-curricular activities, and encourage Principals and the education department to promote socially useful organizations such as the Boy Scouts and Girl Guides, the St. John’s Ambulance Brigade and Cadeting. There should also be provision for sports and cultural activity that provided a full education for students instead of concentration simply on book learning. Education departments should maintain records of what was achieved in this regard by Principals and encourage liaison with institutions that could provide support for such activity. The Cultural and Social Committee could also encourage the provision of entertainment at local centres through film shows, with requests for material from embassies as well as other international organizations. Enterprising students could be encouraged, through Interact Clubs or similar organizations, to develop programmes that would serve the community whilst bringing people together. One obvious area in which local initiatives could contribute to employment needs as well as reconciliation was that of language learning. Grama Niladharis, working with school Principals if necessary, should encourage spoken language classes for all three national languages. The Police could contribute actively to this whilst helping themselves, in contributing as teachers to Spoken Sinhala classes while benefiting by learning Tamil from those they were teaching. Such classes should only be for conversation, and it was heartening to come across a few senior Grama Niladharis who could easily conduct Spoken English classes for youngsters by sparing an hour a week. They certainly seemed willing, and while it would be optimistic to think that all Grama Niladharis could carry out the various programmes decided on, it is likely that a few in each Division could work effectively and make a great difference to the futures of those in their charge.